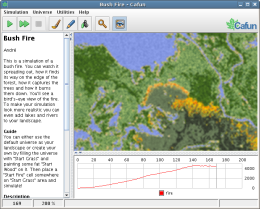 a program which enables you to create impressive simulations of complex systems in an easy way. Complex systems appear throughout all parts of our life. You can see them in form of living organisms, social groups, companies, physical processes or chemical structures. Cafun assists students and researchers in testing their theories or in visualizing a complex system for a better understanding. Furthermore, teachers can use it to teach the creation of real world models in the computer. Cafun is not limited to professional applications though. It was designed to be accessible by all people, even by those with no prior knowledge. Instead of focusing on the details Cafun tries to capture the basic features of complex systems, especially their tendency toward self-organization. Its simulations provide simple metaphors which help us to understand the driving force of form and order. Besides, Cafun is not restricted to the simulation of existing phenomena. Be creative! Feel free to model your own virtual reality and populate it with artificial life. For a brief overview about Cafun read the introduction! It will provide you with enough information to understand what Cafun is all about. Or visit the Download section to jump right into the world of Cafun by downloading your own copy for free! The pictures below show some examples of simulations created with Cafun! None of them is enhanced with an image editing program. It's all pure Cafun! You can see 1.) 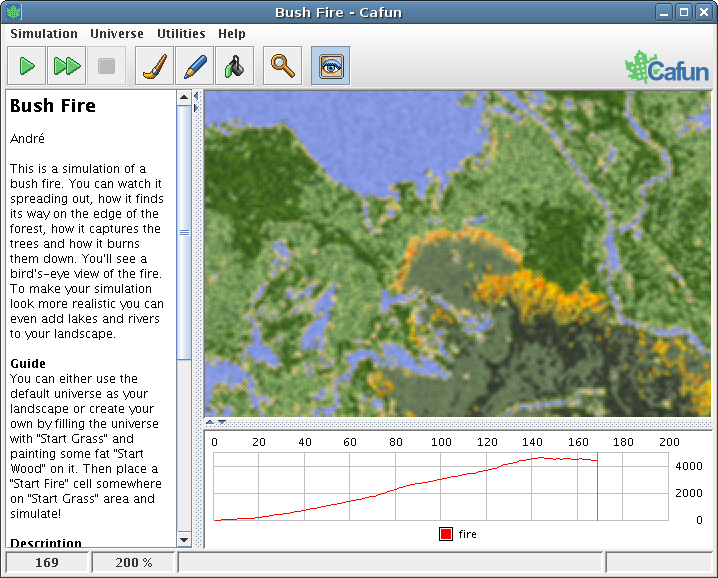 a bush fire finding its way through a labyrinth of grassland, woods and lakes, 2.) a simulation of the Beloussov-Zhabotinsky reaction, 3.) a cell created by means of self-organization, 4.) the famous Langton's Loops, 5.) a group of virtual amoebae multiplying while floating around, 6.) a beautiful structure created by the interplay of autonomous cells. Though Cafun has its own unique way of working it was inspired by ideas of many others. You can join the creative process by telling any questions, comments and suggestions you have! Be encouraged to share your creations with the Cafun community! It is planned to establish a library with simulations created by Cafun's users. Contact information can be found at Contact or visit the Links section to find useful hints on web sites that deal with similar topics and had an influence on the development of Cafun.